Tumultuous times are back on Wall Street. There was a 400-point reversal in the Dow Jones Industrial Average on Tuesday. The Dow is swinging again between big gains and losses on Wednesday. This comes during a month when the Dow has had seven days where it rose or fell more than 200 points on the day, including Wednesday. Most of that action has been to the downside with the Dow down 5 percent in October. But history shows there are certain stocks that thrive during these volatile times. CNBC used analytics tool Kensho to search for which Dow members perform well when volatility is higher than average. 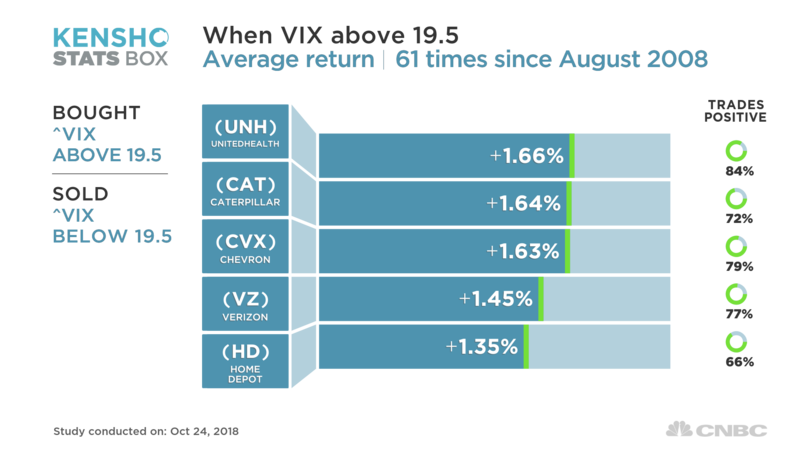 Steady stocks with big dividends and consistent revenues such as UnitedHealth Group, Chevron and Verizon came back as winners. Our search looked at trading in the CBOE Volatility Index over the last decade, finding which Dow stocks performed best during the periods when the gauge was trading above its 10-year average of 19.5. That is, what would your returns be if you bought the stock when the VIX jumped above 19.5 and sold the stock when it fell below? The search also found these volatile times don’t have to be bad for the market overall. The Dow and S&P 500 managed average gains of about 0.9 percent during those periods of elevated volatility but that was amid some wild swings.